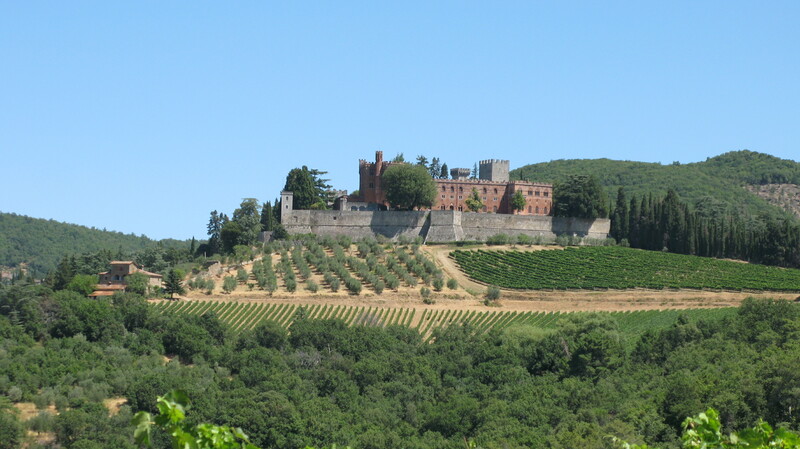 The Ricasoli family have owned the Castello di Brolio since 1141 and claim amongst their clan the Iron Baron, Bettino Ricasoli, former Prime Minister of Italy and wine experimenter. So on another very hot day in the Siena countryside we headed up to the castle (no thanks to sat nav!) to learn about the wine, the history and the man who invented the standard formula for Chianti. The castle has been at the centre of many disputes and wars, mainly between the Sienese and the Florentines. Most recently it was taken over by the Germans during World War II and still shows the scars of the artillery attacks by the alliance. The castle has signs of being rebuilt over the years with different colour stones and styles of architecture. For example one part that is grey brick was built in the 1500’s, another which is red brick was built between 1850-60. The chapel at the heart of the castle has been built, destroyed and rebuilt many times over the last seven hundred years and is still used for special occasions and as the family burial site. Bettino Ricasoli, along with being the second Prime Minster of Italy was an avid geologist and viticulturist. In his preserved rooms in the castle there are countless jars filled with stones, soil samples and his collection of silk worm cocoons – his plan if phylloxera had destroy the vineyards was to produce silk. 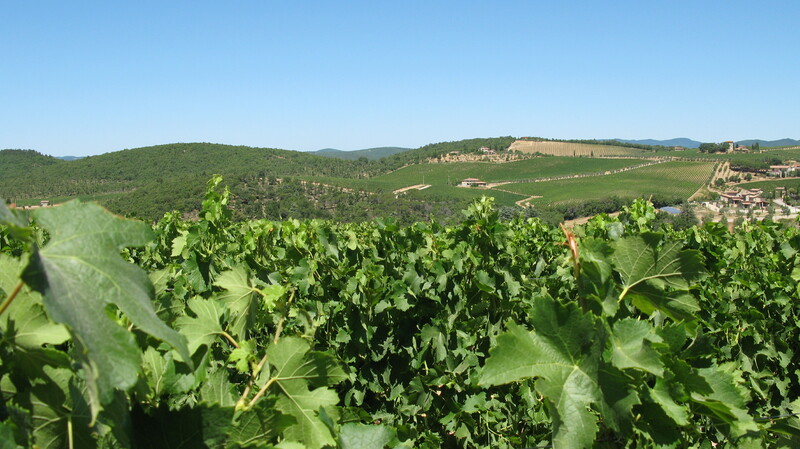 The family have continued his interest in viticultural research and along with the University of Florence have been working on zonation of the vineyards. The 256 hectare site is now split into five different zones which have been re-planted with the appropriate vines – Monte Morello (limestone) has Sangiovese and Merlot, La Grotta (sandstone) is just Merlot. They are also in the middle of experiments with clonal selection. 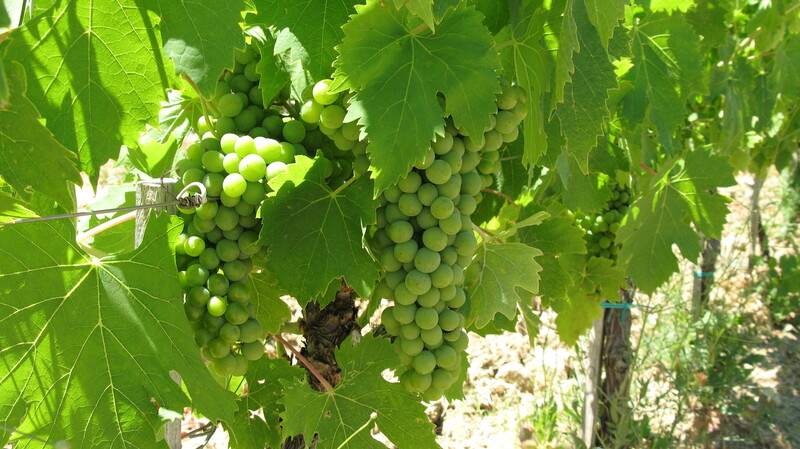 The family have been planting a variety of clones of Sangiovese di Brolio with the hope of improving the vine variety. They had planted thirteen varieties in the experimental vineyard, but ten of those were attacked by a virus. The remaining three have been sent to Rome to be approved by the authorities, but apparently this can take a very long time. Torricella 2011 (IGT) – 80% Chardonnay and 20% Sauvignon Blanc, 50% aged in tonneaux, the rest in stainless steel (6mths). Light and refreshing with good levels of acidity, fragrant and floral with lemon, pineapple and apricots. Great on a hot Siena day. Brolio 2010 Chianti Classico DOCG – 80% Sangiovese, 15% Merlot, 5% Cabernet Sauvignon, aged nine months in old barriques and tonneaux – lots of black and red fruits – cherries, strawberries, medium body with refreshing acidity and slightly gripy tannins – a nice wine to have sitting under the stars on a warm Tuscan evening. Casalferro 2001 (IGT) – small production and only made in the best years, 70% Sangiovese 30% Merlot, 18mths new French barriques – ruby coloured, full bodied, still with lots of black fruits, plenty of acidity and big tannins. A definite food wine – our guide recommended having it with the local boar. After being dragged away from the shop where you can purchase local produce and try a larger variety of Ricasoli wines, we headed to the Osteria del Castello – a stunning restaurant under the shade of the castle and the surrounding woods. I had the Panzanella followed by grilled pork shoulder with fennel and an incredible Mascarpone mousse for dessert. My husband shared his veal marrowbone with a cat that very quickly became his best friend. The food was the best we had on our holiday and the atmosphere so relaxing we could have stayed all day drinking wine and being serenaded by the wildlife. This is a great tour in a stunning area with something for everyone (and a bargain at only 28 euros per person, basic tour). For further details head to http://www.ricasoli.it/.